Oh you know the rules, folks. Make a program in a tweet. But now that tweets are 280 characters, is that double the awesome? Or is it awesome-squared? I'm genuinely excited to see what kind of insanity can come out of double-sized tweet carts. I confess, I'm never going to finish this. I've tinkered with it for over a year and it's just slow going. The AI is meh, there are collision issues and velocity issues, blah blah blah. But I at least wanted to show you guys the concept. One button jumps, one button attacks. Up and down do stances. There's combos in these button pushes. There's a divekick. You get it. I wasn't trying to break new ground, I just wanted something that felt like the nintendo platformers I remember, like Trojan and Rygar and Ninja Gaiden. If you want to improve on it, you go right ahead. If you want more sprites, I'd be happy to oblige. Enjoy. I'm going to keep this consolidated to one thread hereout. This cart is a sampler of basic game functions that I find useful and others might want as well. I'm using these carts personally as a launchpad for more complex game mechanics. Again, I'm doing this to help myself, but hopefully I can help others. If you see a function or technique you think would be a valuable contribution, or a cleaner way of doing the things I've done, by all means! Make another version of the cart and load it to the thread! This is round 2 of my "template" cartridge for building a basic game with multiple players, screens and additional entities. I have now added an animation script, which will allow the writer to load in animation sequences (as sprites) ahead of time, and have a simple function called to advance the animation frame at the right time. Animations can utilize the same sprites in multiple places, control the timing of the animation, and of course loop. Anyways, I'm building these for my own foundation, but I hope anybody else can get some knowledge from them. P.S. this cart uses Lua's fancy "multiple return values" feature, which now that I understand, is like a super power. In order to help me focus on getting things done, I've decided to start Twitch streaming when I'm working on my game. It allows me to sit and tackle a chunk of code while listening to good music and feeding my extroversion all at once. Do you stream? Players, devs, etc. Toss your link in the thread and we can support each other! Version .3 update: Added attacking while jumping, double-jumping, and fixed the scores and glitches. Let me know if you find bugs! This is still my "first game", it's a full screen, enhanced version of the Lowrezjam submission I made. Two players versus only at the moment. Controls are simple. left and right to move your player, up to stab upward, down to block. Buttons to jump and attack. There's an AI in the works but it's laughably, three-stooges stupid at the moment. Graphics are still being tweaked (clouds are janky). Also, the scoring isn't displayed because I have to recode it for 4 or more characters, but you can still win by knocking the other person off the ledge 7 times. Challenge a friend, see what you think. I'll finish the AI, recode the scoring, and maybe speed up the combat a little. Add a double-jump maybe. Under the hood, feel free to peek. The platform collision is all done by one ground_check function. hit detection is done by the sword leaving 'hit bits' on the map. (this led to funny bugs of there being invisible 'mines' around the map when the bits didn't clear properly). I'm being guarded and cautious. Whatever. Enjoy. This was created for LOWREZJAM 2016 in 48 hours, but it's still my first "finished" cartridge I've ever made! Goal: Bash your opponent off the platform 7 times to win. Are you a PICO-8 tinkerer, but haven't been able to see a game to completion? 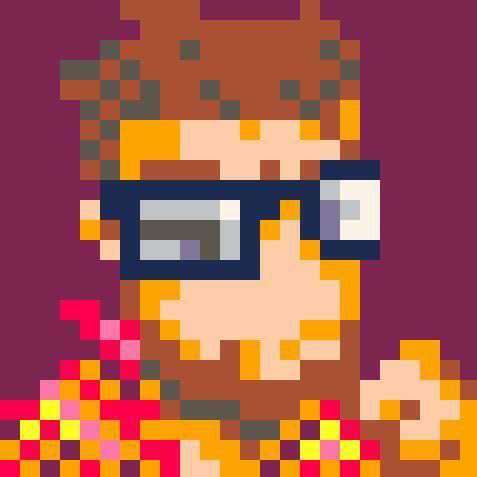 Are your pixel art skills strong, but your code could use help, or vise versa? Do you just simply prefer to work as a team instead of solo? Come join Picocity, a Slack team oriented towards working together to create finished works for PICO-8. While I will proudly say there is no better resource for sharing carts and tips than these official forums, what I was really missing was an environment to motivate me to create finished experiences, not just tech demos or code snippets. Picocity came to be with the hopes that aspiring builders can help hold each other up and see carts through to completion.